Making the transition from an independent act to a major-label player is a tricky proposition. Such a move is made all the harder when one previously has collaborated with Guy Clark and been praised by Stephen King, who lately seems to have become the leading proponent for Texas-bred songwriters. 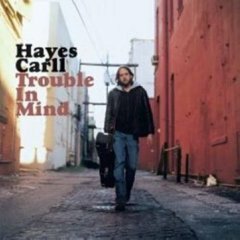 With the release of his third outing Trouble in Mind, however, Hayes Carll seems to have survived the journey with his integrity left intact. Although he still seems to be searching for his own way of expressing himself, he at least has the wherewithal to know what works and what doesn’t. Musically speaking, Carll leaves no stone unturned as he strings together all of the usual suspects: A Lover Like You echoes Bob Dylan’s mid-’60s output; a cover of Scott Nolan’s Bad Liver and a Broken Heart is etched from the Rolling Stones’ country-tinged fare; and It’s a Shame sounds like a collaboration between Steve Earle and The Byrds. Carll seems to be aware that his arrangements are strikingly derivative, though, and on Trouble in Mind’s opening cut Drunken Poet’s Dream — which he co-wrote with Ray Wylie Hubbard — he effectively (and rather humorously) acknowledges and diminishes the criticism. Not only does the tune feel like a lost outtake from The Band, but Carll also playfully tucks the title of one of the group’s many instantly recognizable tracks (The Shape I’m In) into the second verse of his song. Carll’s appropriations carry over into his lyrics, too. He clearly owes a tremendous debt to the likes of Robert Earl Keen, Todd Snider, and, of course, John Prine. Yet, there also is something to be said for the fact that his own compositions succeed in holding their own, despite being situated next to a cover of Tom Waits’ I Don’t Wanna Grow Up. Carll isn’t afraid to wade into the dirt and grime of his characters’ lives, and his keen eye for detailing their surroundings gives his whiskey-soaked, cigarette-stained, and mescaline-fueled tales the kind of gritty realism that they need to feel authentic. Although he quite blatantly may be appropriating material from his heroes, Carll positively nails everything he swipes, which makes Trouble in Mind an easy outing to assimilate into any Americana music fan’s repertoire. If he ever finds a way to merge it all together into something of his own, Carll surely will have a legion of songwriters echoing him.